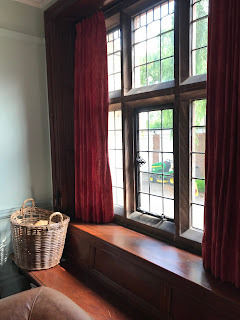 Early in June, right at the beginning of one of the hottest and sunniest summers on record, I went to spend a couple of days at Gladstone's Library in Hawarden, North Wales with a group of writer friends. William Ewart Gladstone, as every schoolchild used to know, (though may not know now) was Liberal Prime Minister for four terms during the years 1868 and 1894. Below is a picture of him taking tea with his wife and his Library is now a beautiful place where groups and individuals can go for intellectual stimulation at events put on by many organisations related to the arts and humanities, or at away days or gatherings like ours. We met to discuss our work and enjoy the surroundings and (let's be honest) to spend time with friends over good food and wine. The building as you approach it looks like this. 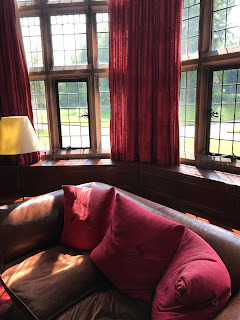 I felt at home immediately for the very good reason that I'd spent eight years of my childhood at a very similar building: Roedean School, Brighton. The actual library is most beautiful and this is where famous thinkers and writers give talks and where you can study the whole day long if you are a guest. even down to a strong resemblance in the soft furnishings and the catches on the windows. There is a wonderful restaurant for the use of guests and you can take your food outside if the weather is good. We did this several times and I can remember hunting out my sunscreen and hat to sit outside on a couple of occasions. The food is excellent and if you fancy something even more splendid in the food department, there's a superb restaurant called THE OLD GROCERY just up the road. I do recommend that most strongly. 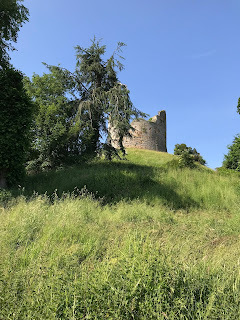 We had a very wonderful meal there on our last night in Hawarden. Lovely reminder of a wonderful time!